Amazing, this is an album that is - dare I say - completely under control, melodies, rhythms, solos, all moulded together like a jigsaw, not a piece out of place. Welcome to Drew Gress's new album, which after "7 Black Butterflies", is another highly complex set of compositions and a top notch team of players to interpret them (the same line up as "7 Black Butterflies" ) - Tim Berne (alto sax), Ralph Alessi (trumpet), Craig Taborn (piano), Tom Rainey (drums) and Drew (double bass). It's always interesting to hear a bass players album, their view point 'musically' is totally different from other musicians compositional perspectives. I guess sitting in the engine room of a band brings out a certain view on how music should happen. Mingus also had this organised yet free approach to music and composition, sensing exactly at what moment a soloist needed to move on, change rhythm or tempo, keeping the listener on their toes (uh,... ears!). Drew's new record is exactly that, a set of highly organised compositions that lets the players develop their own 'thing' in a controlled atmosphere. The sensual melodies are well crafted, but its the arrangements that give this record its special edge. 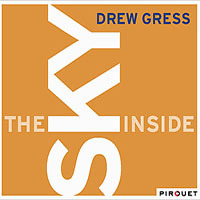 The way that Drew Gress develops each composition is fascinating in itself. I'd be very curious to hear the group live to see how much of the form (backing figures, section changes etc) the band use, and how it works. Complex rhythms lock together with the melodies of the two horns, providing a contrapuntal music which is very rich - "No Saint" (tk1), "Jacquard" (tk7) and "Zaftig Redux" (tk9). There are also tunes that have a more open ended atmosphere, bordering on rhapsodic, and at other moments swing. With a team like this on the record it's hardly surprising to say that Berne, Alessi and Taborn all come up with some great ideas in the space allotted to them in such a framework. The bumpy ride that the rhythm section gives the soloists on "Long Story" (tk3) produce real musical interaction, or the duetting horns of "The Sky Inside" (tk4) are just two such moments. Craig Taborn, like Berne, is able to be either melodic or angular when needed. A track such as "Long Story Short" (tk10) has Taborn dabbing colour onto the musical canvas to support the horns, then emerge into a fully blown solo with its own inner logic. Bass and drums provide whatever is needed throughout the record, swinging, riffing or colouring-in as each tune develops. A record for those who enjoy adventurous soloing, but within the framework of recognisable compositions, and a band that would be great to catch live I guess! You can listen to some samples of the music on Pirouete's website. Can't wait for this one. Not only the same band as for 7 Black Butterflys, but also the same as appeared on The Irrational Numbers. Yes, as you'll see from my review it's a really solid record. In fact I listened to "7 Black Butterflies" to have a better reference point. If you liked that then you certainly won't be disappointed here as it's a (kind of) follow on - musically.